Dr. Kirk: Teeth (ha!). My amazing wife and kids. My awesome team and grateful patients. Amy: I’m thankful for my beautiful children and awesome husband. I’m thankful for God and how he has blessed our lives. Samantha: I’m thankful for my wonderful husband and my wild and crazy children. Connelly: I’m thankful to be starting here. I’m also thankful for my family, friends and dog and cat! Marnie: I am thankful for God, my husband, kids and great grandkids. I’m thankful to be working with such wonderful people and to have them in my life. Sarah: I am thankful for my family and the people I work with. Tiffany: I am thankful for my amazing husband that works so hard, my beautiful son and awesome coworkers! Amber: I am thankful for my extraordinary husband and our 3 amazing children that keep us on our toes. I am also thankful to be working here and to have such wonderful coworkers. Katie: The fall colors and cooler weather. Ciarra: I am thankful great friends, my ability to work, and this beautiful state we are lucky to live in! Thank you for making our job so enjoyable and allowing us to care for all your dental needs. 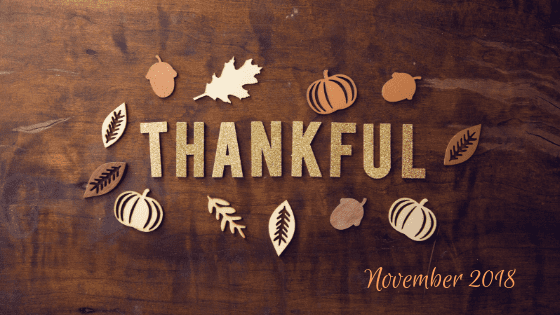 We appreciate all of our patients and hope to hear what you are thankful for this year!